A celebration of life after life! By the end of the weekend the mood had lifted. The happy energy once again began to rise up in my soul. On Monday evening I would cross yet another threshold in my young life. 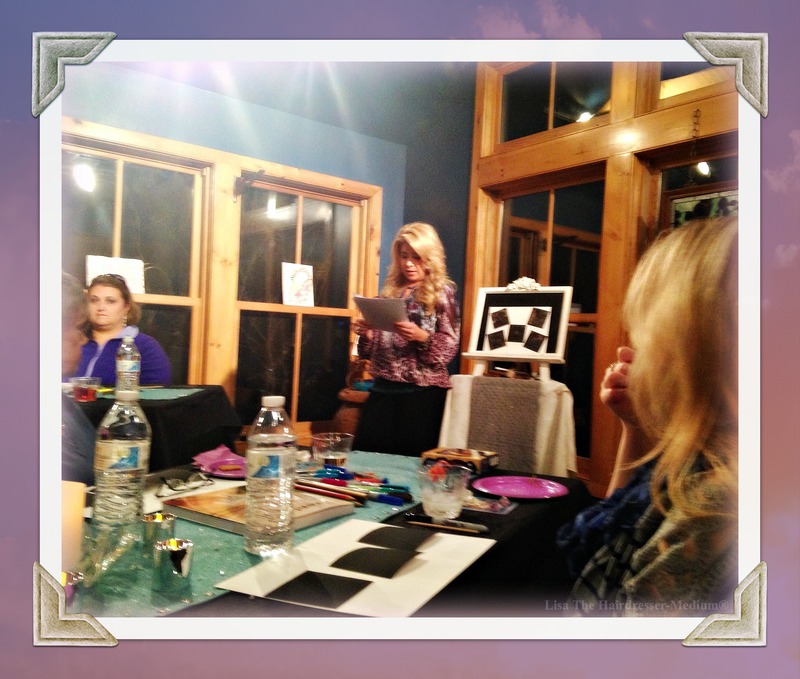 I was to teach my very first Spirit-art workshop as The Transformational Teacher that I am. I was excited yet nervous. The Spirit energy was palpable throughout the day, so of course my nervous system was taking a big blow. At one point on Monday afternoon while putting on my makeup, my heart was racing so fast I thought I might have a heart attack and not even make the class. I thought this isn’t good. I said aloud to Spirit “C’mon now guys! I need you all to relax. Caaaalm down!!! I’m super excited and combined with all of your energies you’re making my heart beat so fast it’s going to beat right out of my chest. I can’t take it!!. Please stop.” With saying that I felt a thought pop into my mind. The thought was to go and have a glass of wine. (That was Spirit talking to me… About Spirits… Haha!!) So of course I did. Within seconds of downing that first sip of deliciously rich Robert Mondavi cabernet I began to relax. My heart rate settled and I felt much better. Ok I thought, now we are talking, and obviously now “they” are listening. So I continued on with getting ready. As I did I set my intentions for the evening’s workshop entitled: Unlock your Inner Heart-ist❤️. I felt great! Everything I had been working towards my entire life was coming to fruition. My dream of being a teacher was finally going to come true. I was so excited! I had always wanted to facilitate a workshop. However I didn’t fully realize it until now. It’s funny how life can do that to a person. They search their whole life for what they are to do. Their purpose, and yet some never find it. I found mine right under my nose. I’m so glad it happened the way it did. I wouldn’t want it any other way. At the beginning of the workshop the Spirit energy once again returned to me with a heavy hitting bang as it mixed with my nerves and the energy of the students in the class. Everything began to turn into an all out nightmare. I quickly had to regroup. I noticed that all the notes I had typed on the papers that I was holding in my hand like my life depended on it had completely disappeared. I couldn’t see a blessed thing. However I knew there were words typed there. I typed them there myself. Only Spirit would not let me see them at that moment. Spirit blurred or distorted my vision. That is when I decided to let go and let God or my guides assist me. I was able to get out of my own way. I let go of the papers and I winged it as best I could. It’s nice having friends in high places. Their wings come in handy from time to time ?. In hindsight I can see now that this is how Spirit assisted me in raising my confidence level. By helping me lose my notes. As my sister said to me those papers were my crutch. I have to agree. My fear was beginning to hold me back. I feel that fear and anxiety hold many of us captive in our lives. Most of us are afraid of not being authentic enough. Expectations of what our peers will think. We become fearful of placing too much out there for the world to see. Fearful of being judged. As human beings we think we need to be perfect and always do things perfectly. Well I’m here to remind you that we are not human beings having a spiritual experience. We are spiritual beings having a human experience. There’s no need to be perfect. I like to say progress never perfection. If we are able to simply be where we are in any moment life becomes magical. All expectations fall away and what remains is simply what is. This is a gift we can all share. We are able to be perfectly imperfect and we can still remain authentic. We are Love, and love begets love. As I began to breathe again I was directed by a voice in my head on the other side to take a deep cleansing breath, to simply relax… and slowwww myself waaaay down…. So I did. After regrouping I felt much better. More confident. Centered and fully grounded. From there all went well as myself and those in spirit knew it would. 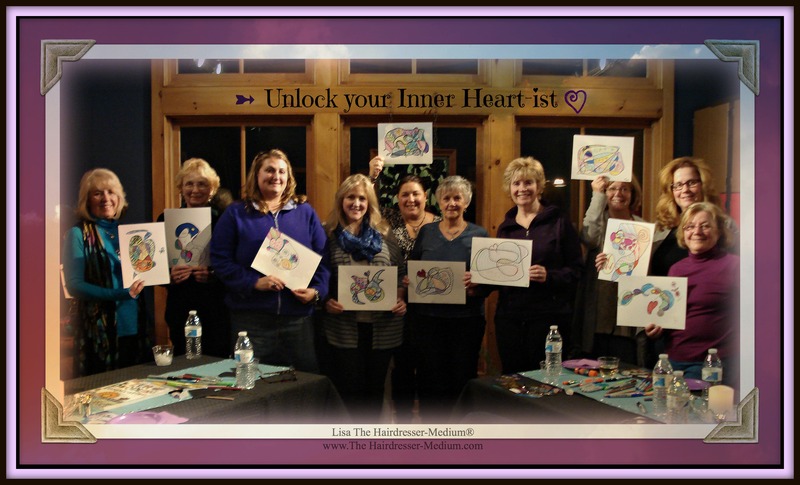 I taught the students in my workshop how to Unlock their Inner Heart-ist❤️(Their Heart-artist). We read Angel/ Fairy cards while each student learned how to receive messages from their loved ones in the Spirit realms. Healing was sent out to all those in attendance as well as those we carried in our hearts and prayers. We also shared our thoughts on everyone’s gorgeous art-work that was created with Spirit’s assistance. This workshop was so much fun!! Some of the pictures to me looked like VanGogh’s and Picaso’s all rolled into Spirit form. 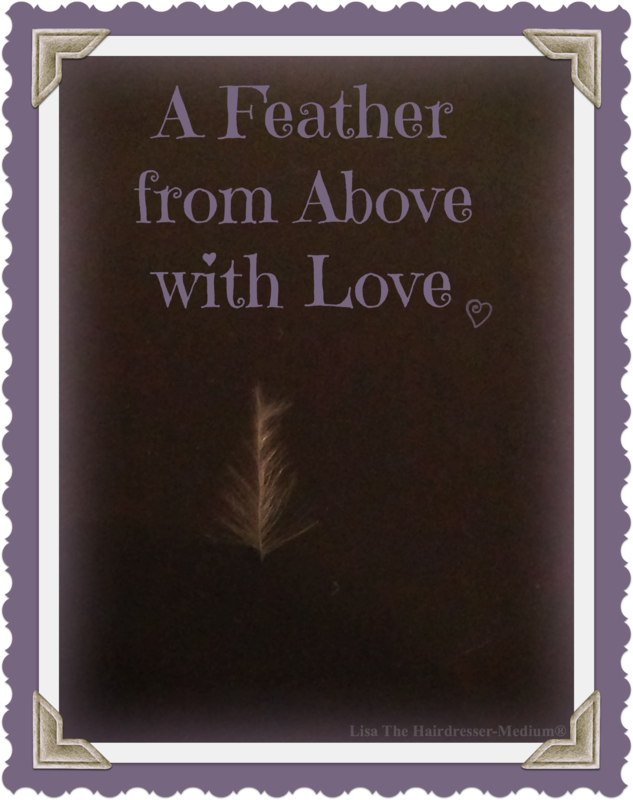 It was a wonderful evening with a lovely group of like-minded souls and their loved ones in the spirit realms. Everyone who attended this workshop was brought together for a special cause, finding the Love within their heart and allowing it to blossom with a kindness that rippled out into the multiverse. This has to be one of my favorite kind of evenings. I am NOW officially a Transformational Teacher! Yay! I love it!!! I teach others how to transform their lives with Love from Above. I thank every single one of you who attended this workshop for all of your support. Especially my friend and client, Margaret for hosting us in her beautiful space. My Mom, Sandy for being the best assistant I could ever ask for. To my sister, Karen and my dear friend and client Kathy for being our drivers, and to Spirit for making all this possible and downloading the idea for this class into my thoughts many weeks ago in the wee hours of the morning. I thank you all from the bottom of my heart! ❤️ I am grateful. I look forward to future workshops where I will get to meet even more of you and hopefully transform your lives for the better as well. *On a side note part of the the proceeds from the evening will be donated to a great cause, Doctors without Borders. The thing about donating to this organization is that my friend Margaret asked me to do this in leu of financial gain for using her space. I thought it was a fabulous idea as I am a big advocate of paying it forward. The ironic part though is that Margaret asked me to donate to this cause a week or two before they were accidentally bombed by our troops. I believe that Spirit knew ahead of of time where the money needed to go. They can always see the bigger picture. I love that! As a hair designer I teach people how to style their hair and how to look their personal best. As an evidential spiritual medium I share with my friends, family and clients how Spirit energy works. I am fascinated by all things Spirit. Always have been. The past 6 years I have been venturing out to Sedona, Arizona. Every time I have gone out there I have taken someone new along with me on a spiritual journey. I always thought I felt a calling to visit Sedona. Not only because it’s so beautiful and the energy of the vortex areas are magical and inviting. However I have come to understand the real reason I have been traveling out west with others. I find that I end up being like a spiritual tour guide of sorts. I end up teaching them all that I know. They in turn end up having an amazing trip which I have been told by Spirit is to be called a “Healing Soul Adventure.” Therefore in the near future (probably some time next fall or next year) I will be running these “Healing Soul Adventures” out to Sedona. Down the line maybe even to other destinations. Who knows, the sky’s the limit! I am thrilled to already have about 4 or 5 clients who are interested in signing up for this “Healing Soul Adventure” without even knowing the itinerary. From what my clients have told me they too want to have the incredible spiritual adventures like I have had. Everyone has their own magical journey out in Sedona. It truly is a magnificent place. Heaven on Earth for those who like the outdoors and want to connect with the spiritual realms. The clients have heard my incredable stories upon my return from Sedona each year and it seems to get everyone excited. If you think you might be interested in finding out more about these “Healing Soul Adventures”, or any other upcoming classes or workshops make sure you sign up for the newsletter “Soul-Filled Thoughts”. I look forward to working with those of you who have a passion for learning more about Spirit or those who simply want to learn more about connecting to your loved ones on the other side. In the future ( I am searching for the perfect space now!) I will also be gathering together a group of like minded souls who want to meet weekly for a Spirit circle meet up. Please know that we are never alone. Our loved ones never die. They simply transform .